Montague is a Canadian town and the largest population centre in Kings County, Prince Edward Island.The town straddles the Montague River which is the dividing line between the townships of Lot 52 and Lot 59. Get outdoors at Basin Head Provincial Park and Greenwich Interpretation Centre. Deepen your sense of the past at sights like East Point Lighthouse and Point Prim Lighthouse. Take a break from Montague with a short trip to The Links at Crowbush Cove in Lakeside, about 36 minutes away. There's lots more to do: see what you can catch with a fishing tour, steep yourself in history at The Sir Andrew Macphail Homestead Foundation, look for gifts at Belfast Mini Mills, and indulge your taste buds at Oyster Lovers Experience. To find more things to do, maps, where to stay, and more tourist information, read our Montague trip builder. Toronto to Montague is an approximately 5.5-hour flight. You can also drive. The time zone difference when traveling from Toronto to Montague is 1 hour. Prepare for slightly colder weather when traveling from Toronto in June: high temperatures in Montague hover around 20°C and lows are around 10°C. Finish up your sightseeing early on the 15th (Thu) so you can travel to Cavendish. 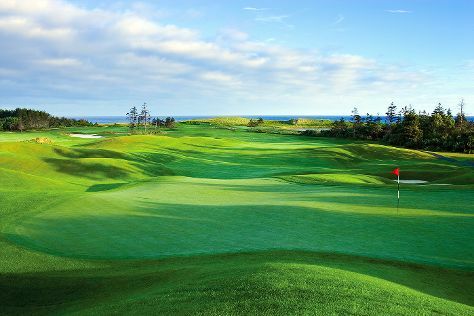 Known to fans of writer Lucy Maud Montgomery as the setting of "Anne of Green Gables," Cavendish represents a top destination on Prince Edward Island. 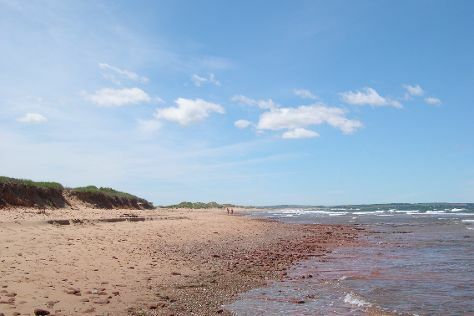 You'll enjoy a bit of beach vacationing at Cavendish Beach and North Rustico Beach. Visit St. Dunstan's Basilica and Beaconsfield Historic House for their historical value. Venture out of the city with trips to Charlottetown (Province House National Historic Site of Canada, Red Shores Racetrack & Casino, & more) and Summerside (Summerside Farmers' Market & College of Piping and Celtic Performing Arts of Canada). And it doesn't end there: contemplate the long history of Green Gables, experience rural life at Island Hill Farm, examine the collection at Anne of Green Gables Museum, and get in on the family fun at Haunted Mansion. To find ratings, traveler tips, and other tourist information, use the Cavendish trip itinerary maker. Traveling by car from Montague to Cavendish takes 1.5 hours. Expect a daytime high around 22°C in June, and nighttime lows around 11°C. Finish your sightseeing early on the 21st (Wed) so you can travel back home.